Elements is very much a restaurant in the Michel Bras vein, arguably more exciting than anything in New York City (well, I do love that Keste pizza.) While it may not have all of the three-star refined touches of Jean Georges or Per Se, it does have an identity and focus that neither of those restaurants, or others, can lay claim to. There are rough edges here and there that serve more as character than flaws. If the restaurant continues to develop under Chef Scott Anderson, and this report one year later suggests it has, it will grow into a solid two-star quality restaurant shortly. There are modern touches in the food, with obvious influences from Spain, but they are integrated with the flavors of the season. 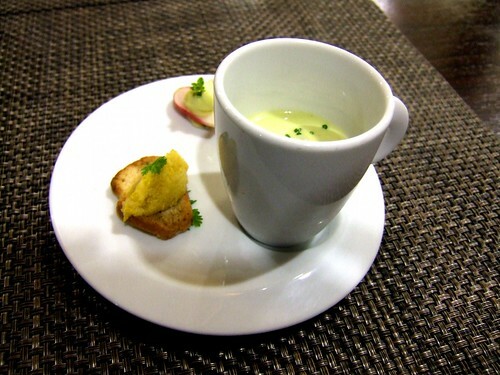 It is an exploration into what new American dining could be. 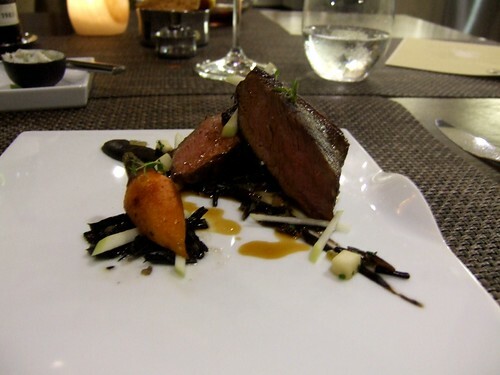 There is a common DNA of many of the restaurants reviewed (favorably) on this blog – a little Ferran Adrià (re-thinking conventions in technique and ingredient) and a lot of Michel Bras (nature, time, and place), with nods to Alain Passard (vegetables) and Pierre Gagnaire (conventions and stream of consciousness. )1 Elements falls squarely in this profile – it is modern without flaunting it. 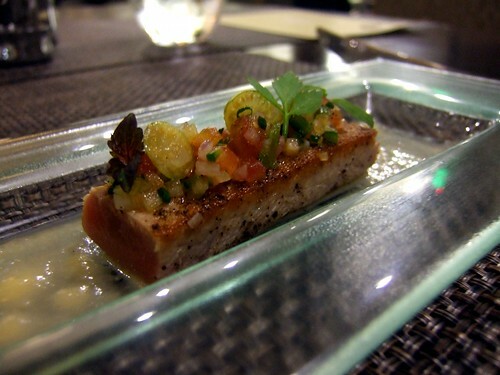 Their fascination, and use, of “new” products, whether it be the Kindai tuna (they were among the first to serve it in the US) or mangalitsa pig (again, among the first) distinguishes the restaurant from its peers too. The industrial production of food has limited our protein choices, whether it be honing on a few basic breeds for profit or depletion of valuable ocean resources. Restaurants should lead the charge on raising awareness around alternative choices (that, most importantly, taste good), for they are at the forefront of influencing consumption, particularly in the new TMZ-like world of celebrity. Fish is a conundrum but there is no reason that heritage breeds of chicken, pork, and other animals can not be saved – and we can save them by eating them. And then there’s that simple matter of execution. 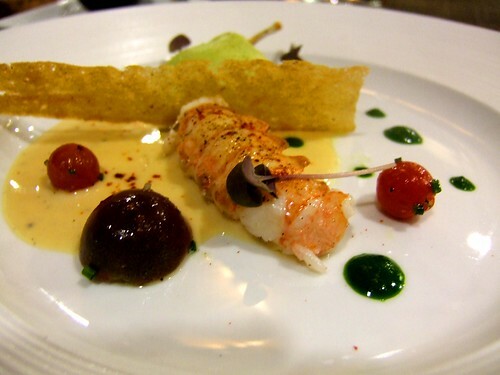 It sounds trivial, and it’s absolutely expected, but few restaurants perform consistently throughout a tasting menu, nailing each dish, particularly when it comes to seafood. In fact, my new motto is “when in doubt, serve it raw” (a great hipster t-shirt idea if there ever was one!) Elements nailed the cooking on each piece of protein. 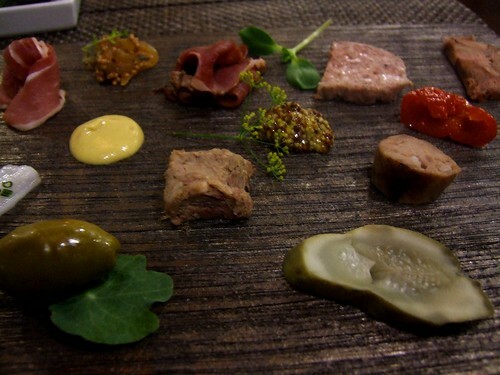 This meal took place last Fall – this review just in time for, um, this Fall. It was arranged with Joe Sparatta 2, the sous chef, who invited me to eat in the kitchen dining room (a must, imo, if my writing is convincing.) An entire room to myself, a kitchen cooking for me, a bottle of wine (85 Vina Tondonia Gran Reserva), and a tasting menu – life is not always cruel. I’ve had Mangalitsa several times now but this was my first experience. The obvious comparisons are to wagyu beef or toro – the meat has grease between its cells instead of water. 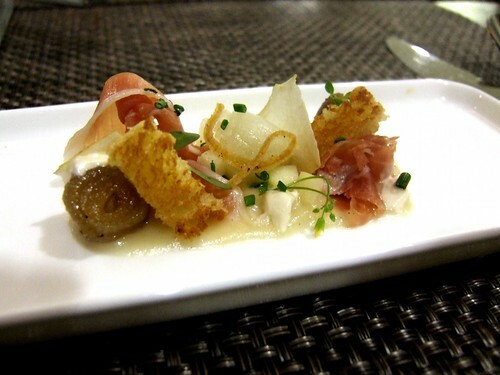 This lardo obviously had a luscious mouthfeel and it was a tremendous introduction to the pig breed. This was left over from a Mangalitsa dinner from a few weeks earlier – sounds awesome but it would be quite a challenge to successfully cut that much fat throughout an entire meal. Given the current “pig anything” craze, I’m surprised Mangalitsa is not the trendiest animal alive – it should be. 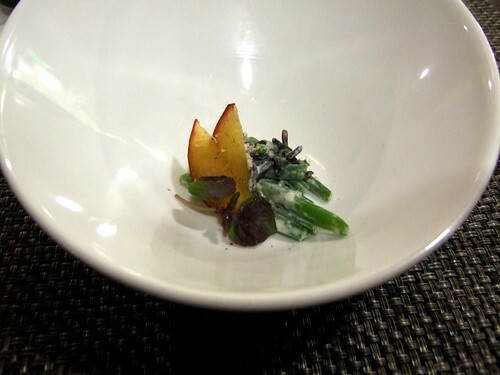 The onions and apples in this dish were nice companions with their varying degrees of sweetness, acidity, and textures playing off each other. This was a nice start that awakened the palate and taste buds – jumping jacks before the workout routine. The Kindai fish intrigued me and played a role in my reservation, as this was my first (known) exposure to it. 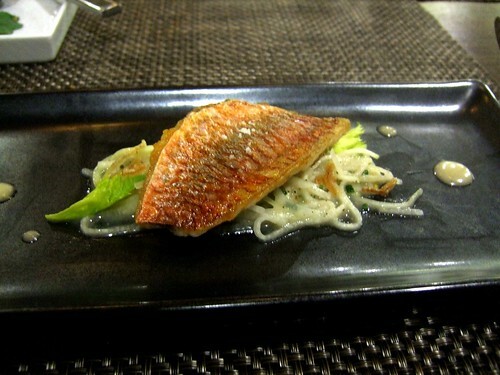 I have had various Kindai since this meal and it generally tastes very good for a farmed fish. This was an abbreviated “head to tail” sampling, emphasizing different textures. The sauteed rib was excellent, the crispness providing a perfect foil for the fattiness inside. The belly had a just-right oiliness quality to it. 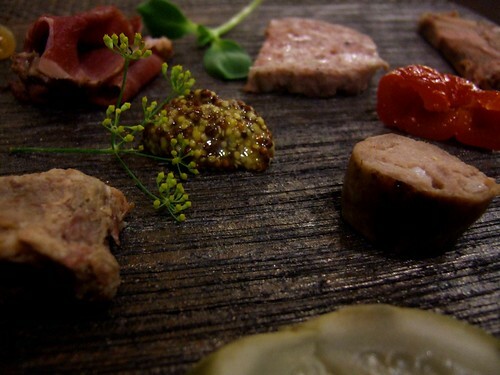 The raw cheek was the most flavorful piece, providing just enough chew with each bite for maximum flavor extraction. An interesting dish as the fish did not have much flavor, outside of the slight sear, but its texture was quite special. Each bite, providing a satisfyingly optimal resistance, released a grin-inducing splash of oil that coated the entire mouth – stunning – its texture rivaled the best chu-toro tuna I’ve had in Japan. 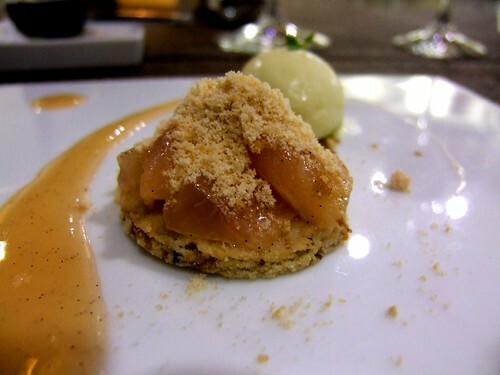 This dish was a testament to the execution of the kitchen – firm, sweet, and just a touch of warmth in the middle. The frying of the frog’s leg was also accomplished. 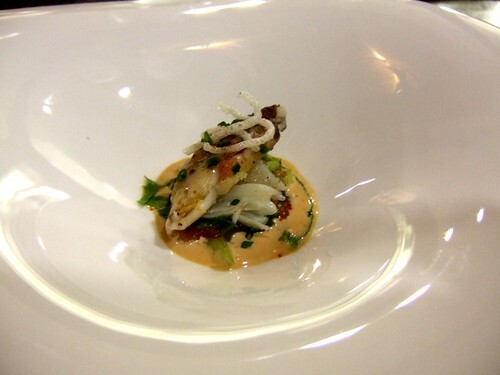 This, like the dish below, had shades of a Pierre Gagnaire mix of land and sea creatures. 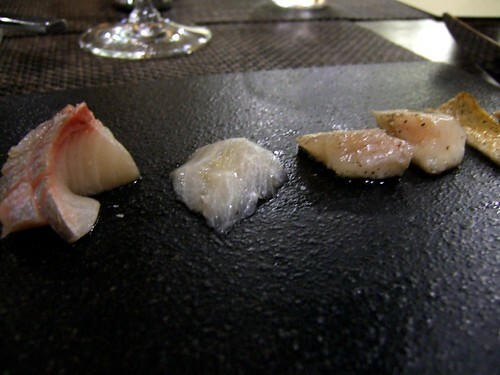 The textural interplay, and sea/earth tastes, between the silky black cod, spätzle, and porcini had a Pierre Gagnaire quality to it. An impressive display of pig parts – the texture was generally more giving than one would expect (the fat?) and the sweetness of the Mangalitsa was apparent in most. This platter made my night – it was not my favorite dish – but it was the most special. For good reason, this seems to a be a signature of the restaurant – very delicious. It could be a reference to The Fat Duck, breakfast for dessert, but it’s not derivative in any way. It serves as a good gateway to dessert – salty, smokey, and sweet – with ample dosages of bacon that recall the earlier Mangalitsa dishes. The obligatory Blis syrup (you don’t stock it in your pantry?!?!?!) was also used, its sweetness and depth remarkable. Lard and bacon flavors are becoming increasingly popular in San Francisco for non-savory items, such as caramels, pecan pie, caramel corn, and more. 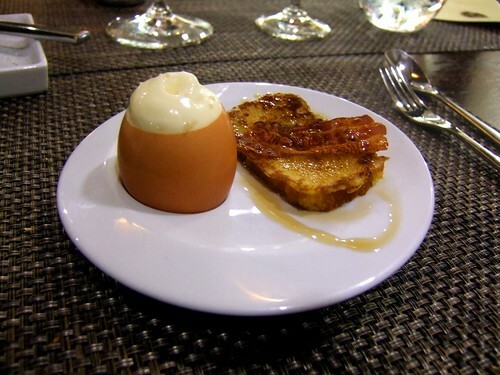 If Elements continues to feature the Mangalitsa pig throughout its menu, I would recommend that it be incorporated in another intermediary dessert course. There are worse things than to be known as the “Mangalitsa restaurant” but a creative interweaving throughout the meal could add further cohesion and surprise. The restaurant has not caught on in the blogosphere but there are a few other favorable reviews. Opinionated About was one of the first to write about it – with Wizard of Froz and Wandering Epicures eating there just before me. Taetopia has also written a nice review. And, finally, the New York Times wrote a review two months ago. 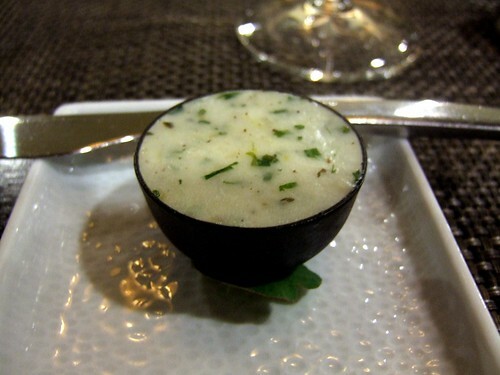 1 – I just finished meals at l’Arpege and Pierre Gagnaire last week – stay tuned. There is a lot going on in this declaration that I will continue to develop in future blog posts. 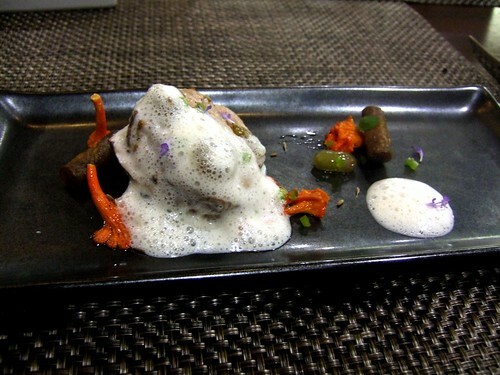 I think that DNA serves as building blocks for most of the exciting (Western) restaurants in the world. Japan is somewhat inherent in Bras, but now that Japan has “opened” up to some degree (thanks to Michelin and various chef exchange programs), I suspect we’ll see more of a profound influence from that cuisine, much different than current nods to “fusion” found in so many poor restaurants. 2 – It was a textbook case in the value of blogs and “the ongoing conversation.” Elements linked to my blog and I saw a steady stream of visitors – which piqued my curiosity – and then developed into a great interest in the food at Elements. It was quite clear their restaurant fell completely into my target demo – and we finally arranged a date. Engage and participate. The Ideas in Food association did not hurt either – I hold them, and the two meals they served me, in the highest regard. 3 – Riding on a train through Newark at midnight is an experience straight out of The Wire. I heard many tales of drug deals gone bad and crooked cops that night. What can I say…I am very envious again. 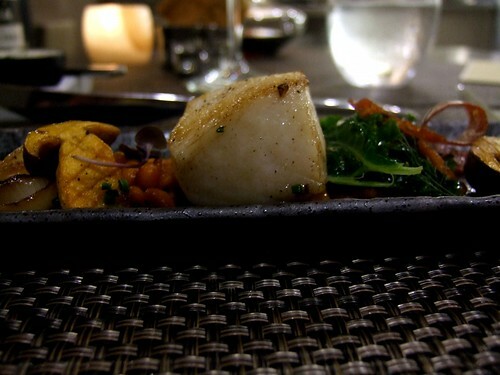 chuckeats, I enjoyed reading your review of elements and very much appreciate the link to mine. We haven’t been back since that first dinner a little over a year ago, so it’s definitely past time for a revisit and to experience it, as you did, at the kitchen table. do you mind sharing the financial side of your visit with us? i am wondering how it compares to NYC. Wow, that looks incredible! 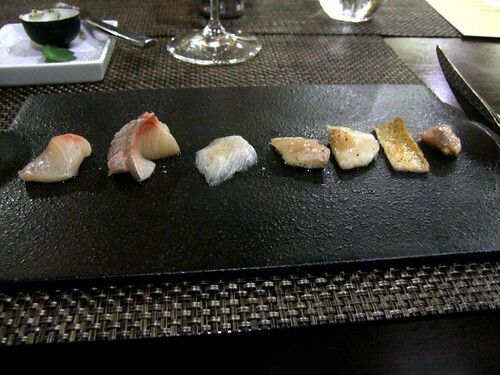 The Kindai kampachi tasting looks like fun… and the black cod, mmm. Great review. I’m definitely going there if I’m ever in town! thomas, much cheaper than a comparable meal in NYC, but about the same once transportation is factored in. Thank you for the link – great post! 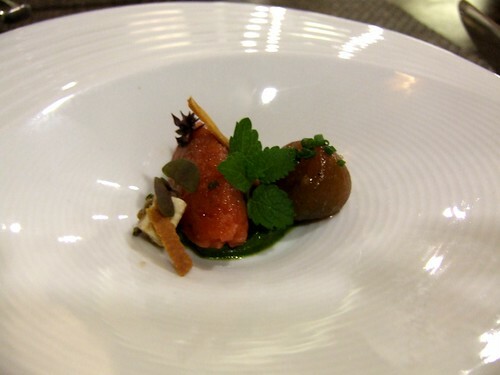 We’ll be doing the chef’s table at elements ourselves in two weeks, and excited is the understatement of the year. Very much enjoying your blog. San Francisco holds a very dear place in my heart. Perhaps we’ll meet on one of our coasts someday.